What are you Grateful for? Imagine being asked that by your server, as you sit down for a celebratory meal in a carefully chosen eatery! We are celebrating Simone’s graduation from Berkeley University. We dine early to allow time to walk to the ceremony. At 4.30 in the afternoon,the place is well filled with a mother and toddler, several groups of students, and our rather over-dressed party of four. All the food is live, organic and vegan. All that can possibly be locally grown is. I love all of that. I am Whole, a bowl of shredded kale and quinoa. I settle for the I am Hopeful, a raw version of Pad Thai. It is truly heavenly! Glancing around at the open kitchen, I watch the staff mindfully pile up the plates, everyone calm and focused. 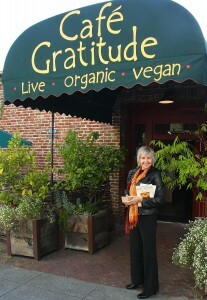 They have been hired for their willingness to prepare all the food with love and consciousness. A thousand things spring to mind to be grateful for. Just being here first of all, with dear ones, and, now, about to select from the most seductive dessert menu a yogini could imagine. No sugar or flour or dairy is used at all! I am grateful for that. We share the I am Rapture, the strawberry shortcake and the I am Magnificent, the raw chocolate mouse. Both dishes live up to their naming and are a most fitting crescendo to a symphonic meal of sheer delight. As I check my make-up in the tiny bathroom, I look straight into the provocative question posted just above the mirror: “Do you know how beautiful you are?” I take a deep breath and a moment of stillness, to allow that one in. Yes, I am, and I am very grateful. PS: Great news! 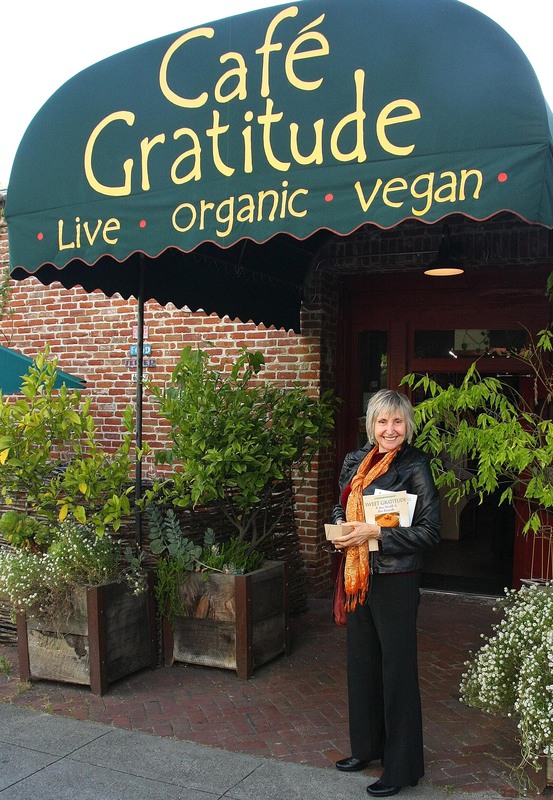 Cafe Gratitude is now also in L.A. Check it out!